Or, the story of a disco spaceship gone dark. In the shadow of City Hall stands the most controversial piece of public art in L.A.
Join Field Agent Sandi Hemmerlein as the Atlas Obscura Society L.A. visits the Triforium sculpture, a three-pronged, six-story public art piece that has been silenced since the 1980s and has stood inert for decades. 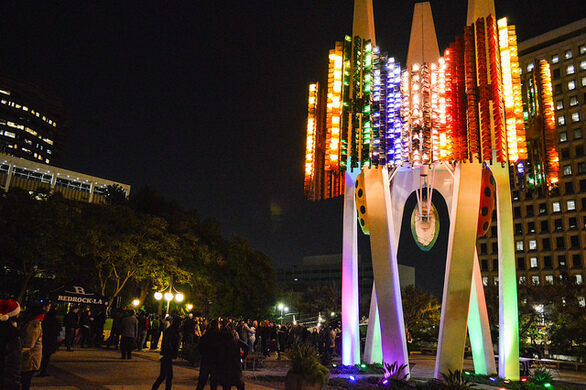 With the founders of The Triforium Project as our guides, we'll learn about the history of the astrological beacon that never reached its extraterrestrial potential, as well as about its creator—mosaic artist and sculptor Joseph Young. As a special treat, our group will get special access to enter the forbidden, original Triforium Control Room, a kind of time capsule in an underground bunker that shows what a big computer and complicated control panel were necessary to operate such a multimedia spectacle—the kind that can still captivate audiences today. 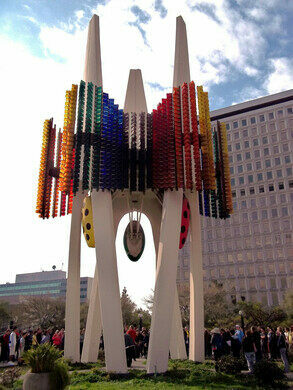 If it were to land on our modern art scene today, the Triforium would be a social media sensation. People would be lining up to witness—and capture—the flashing lights and colors beaming out of this cathedral of sound, music, and light. 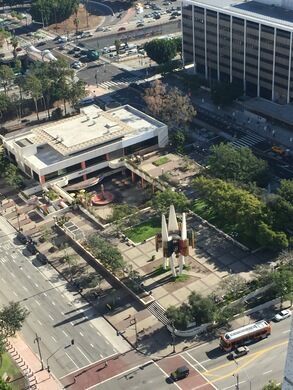 But in 1975, when it made its debut in the Civic Center district of Downtown Los Angeles, the kaleidoscopic, futuristic sculpture proved too ambitious (or audacious) for its time. Instead, the disco-tinged chimes of the bell tower fell on the Southland with a resounding thud. But this artifact of technology has captured the imaginations of a new generation of art lovers—particularly those with an affinity for the quirky, the oddball, and the otherworldly. Capacity is extremely limited. Because of space restrictions, we will enter the control room in shifts. If you cannot attend the event for the entire duration, we cannot guarantee access before an early departure. If you have any issues with small spaces—particularly those that are underground—this is not the tour for you. 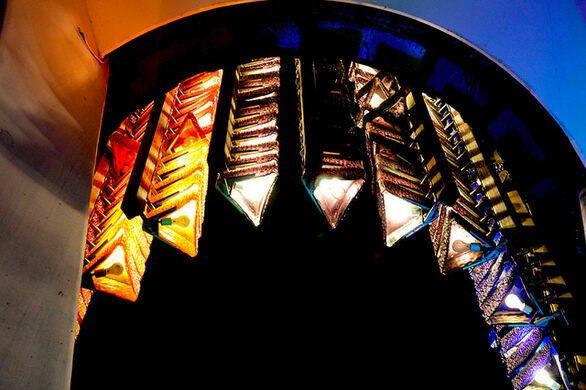 A portion of the proceeds from ticket sales will benefit the restoration efforts of The Triforium Project. Additional donations are also welcome. Street parking available but pay close attention to signs and restrictions. Go Metro! The meeting spot is a short walk from either Union Station or the Civic Center / Grand Park station on the Red Line. Be prepared for up to two hours of standing with some walking and climbing stairs. As this is an outdoor public art piece, wear sun protection and bring drinking water. Sorry, but no dogs or children under 12 in the control room. All minors must have a ticket and be accompanied by an adult. Not handicap-accessible. You must be able to climb stairs in order to enter the control room. Advance Tickets Only. All Sales Final. No Refunds or Exchanges. No children under 12. Minors must be accompanied by an adult.